MINSK, April 15 (Xinhua) -- Intensive and fruitful parliamentary exchanges formed one of the foundations for the comprehensive strategic partnership between Belarus and China, said top Belarusian legislator Mikhail Myasnikovich. Myasnikovich, chairman of the Council of Belarus's National Assembly, or the parliament speaker, made the remarks in an exclusive interview with Xinhua prior to a visit to Belarus by Zhang Dejiang, chairman of the Standing Committee of China's National People's Congress. 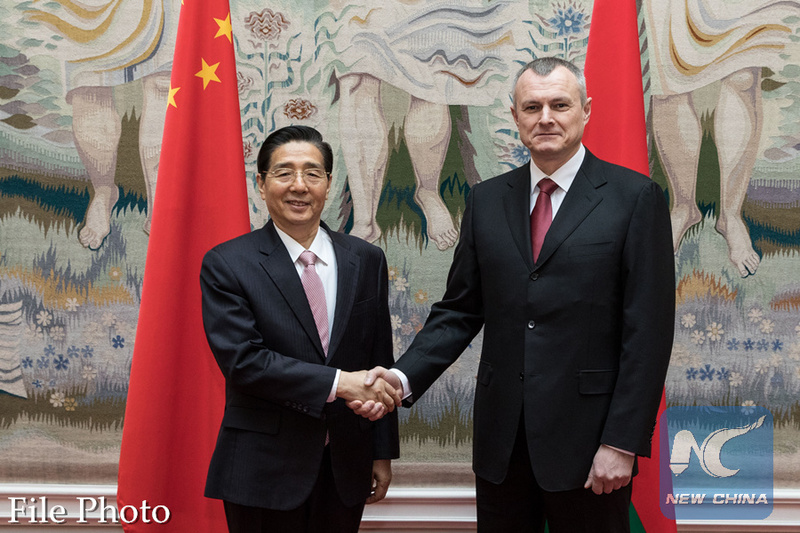 "The parliamentary exchanges between Belarus and China were activated immediately after the establishment of diplomatic relations," Myasnikovich said, adding Belarus spoke highly of the results of earlier visits by the two countries' parliament leaders. He stressed that it is very important to continue the constructive contacts between the two countries' parliament leaders, which also involve the practical cooperation in economy. He said that Belarus thinks the exchanges between parliament leaders and the coordination of the two countries' law-makers in international organizations are significant for bilateral relations. The parliament leader called for promoting the role of parliamentary exchanges in the two nations' promising cooperation. During a state visit to China by Belarusian President Alexander Lukashenko in September 2016,the two countries agreed to build mutual trust and win-win cooperation as part of the comprehensive strategic partnership. The bilateral relations have reached an unprecedented level since then. "Over the 25 years since the establishment of diplomatic ties between Belarus and China, the forging of such a high level of partnership is the main political achievement in the development of the bilateral relations", Myasnikovich noted. In recent years, the high-level visits between the two countries have become increasingly active. Almost all the state organs of Belarus have established partnerships with their Chinese counterparts. Both sides have formulated and implemented relevant projects. States and the capital city of Belarus have established the twin-city relationship with the Chinese side, Myasnikovich said. "I want to emphasize the achievements of the scientific and technical cooperation between Belarus researchers and China's local centers of scientific research, which we believe has a great prospect," he said. Speaking of the two countries' plan to further develop their friendship, Myasnikovich noted that the idea fully corresponds to the spirit of mutual trust and win-win cooperation agreed upon by the two sides. "For our small country, China becomes an 'umbrella' in the world's political bad weather. Today, there are too many uncertainties in the politics of large countries, and China takes the responsibility to act as a stabilizer" on global issues, Myasnikovich said. He also stressed that the friendship between the two countries enables them to move further towards a community of shared future for mankind, an idea championed by Chinese President Xi Jinping and, in the eyes of many, represents the ultimate goal of human development.